Bukkur Island is a large outcrop of limestone situated in the middle of the Indus River in south-eastern Pakistan. The town of Rohri lies on the east side of the river. During the First Anglo-Afghan War (1839-42) the British took the island fortress of Bukkur. 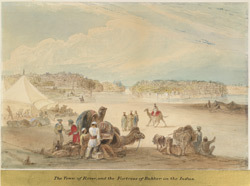 This view shows a a group of travellers with camels in the foreground.